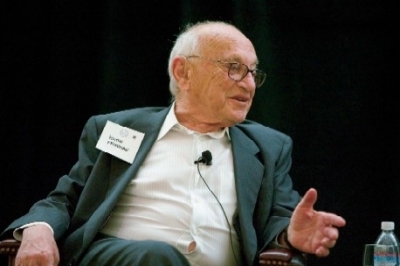 In this 2005 interview, Milton Friedman discussed the ailing U.S. health-care system and proposed some remedies. The first step? Vintage Friedman: Get the government out of the health-care business. 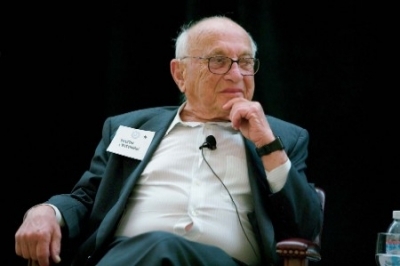 Robinson: Milton Friedman, let me begin by quoting you to yourself. “We are heading toward completely socialized medicine, and if we take indirect tax subsidies into account we are already halfway there.” Now you wrote that before the Republicans took control of the White House and both houses of Congress. May we safely assume that Republicans are engaged in reversing the trend toward socialized medicine? Friedman: We may safely assume no such thing. They have taken two major steps, one forward and one back. The forward step was the extension of the health savings accounts. But that was accompanied with a backward step in socializing prescriptions by the prescription insurance plan. And, taken all in all, the government fraction of total spending on health care paid for by the government one way or another has been going up not down. It’s well past 50 percent right now. Robinson: All right. In every industrial country medical spending tends to rise faster than overall national economy or output. The Economist magazine reports, for example, that in a group of 18 developed countries the share of GDP devoted to health care rose from 5.2 percent in 1970 to 8.9 percent in 2001. Why do we see this phenomenon? Friedman: That’s a very understandable phenomenon. People are getting richer. They have a larger income. They’re living to a longer age. Medical needs go up with age and health; medical care is a superior good on which people are willing to spend a larger fraction of their income. But you have to look at those statistics with care. What they say is true for every country. But the degree of the shift has been far greater in the United States than in any other country. We spend more per capita on medicine and health care by far than any other country. The major increase has come since 1965. And that’s because in 1965 the United States enacted Medicare and Medicaid. And that was a stimulus to greater spending. Robinson: You said that these programs, Medicare and Medicaid, have cost far more than originally projected, but that this shouldn’t surprise anybody. Friedman: No. All government programs do that. Robinson: If you offer something for free, the demand is essentially infinite. Robinson: Now, as I make it out, among industrial countries there are fundamentally three different ways of paying for health care: with taxation, as in Canada and Britain, effectively a nationalized health service; with compulsory contributions by employers and workers, as in Germany and France; and then, the third, with big contributions from private-sector health insurance, as in the United States. In this country, the government pays for the health care chiefly of the poor and the old, and the greater part of Americans are covered instead by private insurance. Friedman: You’re misportraying the picture for the United States, because what you leave out is the tax exemption for medical care that is provided by employers to employees, so that the government in effect, through tax deduction, through tax preference, pays for a large fraction of the medical care of the high income, middle income, all the way through the incomes. You said that private insurance . . . Insurance is private in one sense—it’s privately owned. But it’s financed largely by the government. Friedman: It came about because during World War II you had wage and price controls. One bad piece of legislation leads to other bad pieces of legislation. We had wage and price controls, and yet we had a real boom because of the pressure for war production. In the process, employers found it hard to get workers. Robinson: A lot of the manpower was overseas fighting the war. Friedman: Yes, that’s true also. They had a lot of woman power. But they couldn’t pay higher wages, and so they started off with special additions that weren’t covered by the rules and regulations. And they found that one of the most popular additions they could offer was health care. And so health care spread. And of course, although technically they were supposed to inform the IRS and treat that as part of workers’ income, they didn’t do it. And about two or three years later the IRS woke up and started to request that workers do that. And there was such an uproar that Congress passed a law exempting employer-provided health care from taxation. Robinson: So we simply backed into the third-party paying system in a fit of absent-mindedness while our minds were on Adolf Hitler and the Japanese. Friedman: Because somebody else is paying for it. Robinson: You refer to Gammon’s Law, named after the British physician, Max Gammon, which holds, “in a bureaucratic system increase in expenditure will be matched by fallen production.” Now that’s intended to be at least partly facetious. Friedman: In his case it wasn’t and it isn’t in ours. If you take hospitals, you have increasing people and fewer beds. The output in the sense of the beds goes down while the bureaucratic organization expands. Robinson: So there’s some sense in which, past some point, the dynamic is such that the bureaucracy will absorb a greater and greater proportion of any input. You actually can get declining services. Friedman: You do. In the hospital case it’s clear. That can be countered, and it has been in our case by the advances in science. But the scientific advances, which have been remarkable, are the one thing that has kept us ahead of the game. Robinson: If you didn’t have to take political realities into account. If I could wave my hand and make you emperor for a day, how would you reform the U.S. health-care system? Friedman: Well the first and most important reform would be to eliminate the tax exemption of employer-provided medical care. Robinson: You’d do that before abolishing Medicare and Medicaid. Friedman: Yes. There’s no reason and logic, no reason on principle why medical care should be treated differently from other things. Food is just as essential to the life and health of a child. So is shelter and clothing. But those things we more or less let the private market take care of. What differentiates health? You might say, “Well, there are large costs involved. Sometimes you have to have big operations.” Well that’s what the private insurance is for. You have a large cost in a fire in a building. But that doesn’t mean that we have government fire insurance. Robinson: If you could eliminate the tax exemption, you’d transform the insurance sector and suddenly you’d get health insurance similar to car insurance or home insurance. It would be what insurance is usually for, which is to protect you against a catastrophic event, not against routine events, like . . .
Friedman: Moreover the employers could then take the money they’re now spending on medical care and use it to raise the wages of their employees in money, direct wages, and employees could decide what fraction of their income they’d like to spend on medical care. The major defect of our present system is that employees, most of them, are spending in practice more on medical care than they would if they had their free choice. They’re getting something for free—supposedly for free—that somebody else is paying for. Robinson: So you can just load up on it. Friedman: Right. But the other thing that would be extremely important would be to make it possible for people to buy insurance in any state. If you’re in California right now and you want to buy yourself a medical insurance policy, you have to buy it from the company that is licensed in the state. And that means that essentially you have 50 different sets of regulations for what insurance has to contain. It’s a crazy system and it seems to me that it’s perfectly unconstitutional. It violates the commerce clause. You have 100 percent protectionism with respect to insurance. So it seems to me the single most effective thing you could do would be to have the federal government make it legal—I don’t know the exact law that would be needed—but something that would enable any person to buy insurance from any state. If I find an insurance policy issued in Connecticut that I prefer to an insurance policy offered in California, why shouldn’t I be able to buy it? This interview was conducted for the World Health Congress on November 21, 2005.